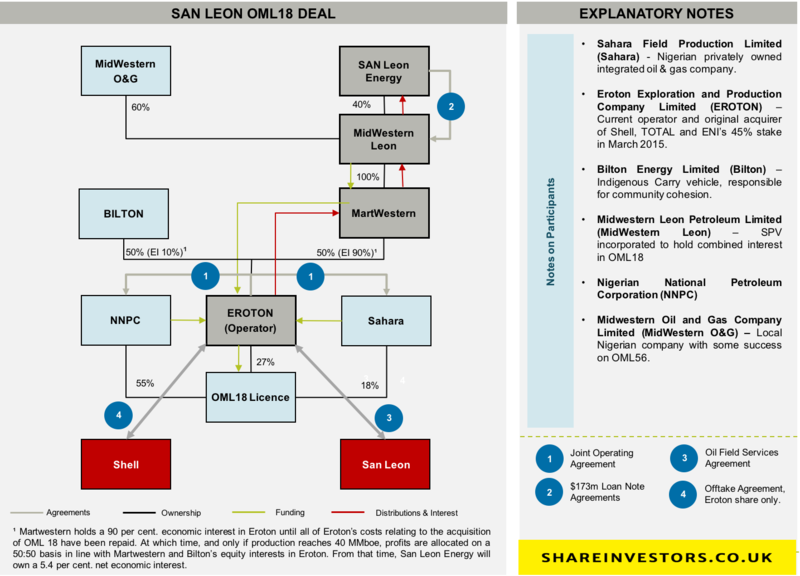 It has been an interesting year at San Leon Energy (SLE.L). After many years of struggling to create value from its existing asset base the company did a fairly impressive Nigerian deal in the summer of 2016. After a period of bedding down it emerged late in 2016 that San Leon was subject to a potential takeover from a mystery Chinese bidder and at a fairly sizable premium to the share price at the time. So the signals from San Leon towers were looking very promising indeed, I had hence rated this as a ‘BUY’ in both my previous posts. It has though gone very quiet from San Leon since the excitement of late 2o16 and we have so far had no formal update on the potential Chinese deal in the first two months of 2017. We did though get an operations update in the thick of ‘bury news’ season, on 3oth January 2016. In today’s piece I take a look at that Operations update and consider whether there was indeed bad news to bury and if so whether my BUY view on San Leon should change. San Leon Energy is an oil and gas exploration and production company. The company has a diverse portfolio of assets, but the core part of the business is a 9.72% economic interest (5.5% Shareholder interest) in the OML18 onshore block in Nigeria. San Leon issued an RNS on its operations during the classic ‘no ones watching’ period on 30th December. This release was right in the middle of the traditional few days where companies attempt to bury bad news, so I was naturally sceptical. The operational progress on the ground was actually fairly good though, confirming that the OML18 production reached a peak of 61,000 barrels of oil per day (bopd) during the period. Production was around 50,000 bopd at the time of San Leon’s acquisition, so a 20% uplift in 6 months suggesting things are on track towards the stated target of 115,000 bopd by 2020. The Company’s Admission Document, published in August 2016, provided details on the mechanism for dividends from Eroton to be made via Midwestern Leon. The conditions required to be met prior to dividends commencing were set out in paragraph 2.11 “Satisfaction of the conditions to approve distributions by Eroton” on page 59 and the Company is today providing an update on which of those conditions have been met. (iii) undertaking from Eroton to commence discussions on an optimal hedging strategy from 1 January 2018 to final maturity date of the RBL facility agreement and has to be in place by September 2017. (v) submission of audited financial statements by Eroton whereby 60 per cent. of audited net profits can be paid to dividends account. The Company has been informed by Eroton that the timing for the satisfaction of these conditions is also influenced by the receipt by Eroton of the outstanding balance of historic cash calls from the Nigerian National Petroleum Corporation (“NNPC”), which was expected during 2016 but has yet to occur. It transpires that EROTON does not have adequate reserves to make the dividend payments as yet. In my view this is likely to be a technical issue but also an actual liquidity issue. The main reason cited is the failure for the NNPC to settle historic cash calls. Fairly significant CAPEX has been expended on the OML18 licence to try and boost the production and it is suggested NNPC have not yet settled all of the bills in relation to this. EROTON does receive an income from the offtake of hydrocarbons, but it appears this is not enough to enable distributions upstream without NNPC settling its Capital account. Perhaps no surprise, it has been well published that the NNPC has historic cashcalls due to various oil companies operating in Nigeria of around $6.8billion. According to its website, the NNPC has now installed a mechanism which will lead to the settlement of historic cash calls (pre 2016) which is encouraging, but NNPC set a timescale of 5 years to do so. At present we don’t have visibility of the amounts owed to Eroton nor how much of the cash calls are required to be settled so that Eroton can start upstreaming cash. San Leon have confirmed that they are exploring other mechanisms to try and receive disbursements, but there has been no update on this so far in 2017. What does this mean for San Leon? How is the balance sheet? I have prepared an estimate of the cash position for San Leon as at End Feb 2017, i.e. now and where the company could be at April 2017 without resolving a payment mechanism with EROTON. It was envisaged that the CAPEX for OML18 should be self funded by the EROTON receipts from offtake, so I have not assumed any further contribution needed for this. I am also not aware of any material funding needs on the other non Nigerian assets. My conclusion – San Leon must be running on fumes now if I am correct in my calculations, which I have illustrated by figure 2. The big payments to/from San Leon relate to the Poland asset disposal and a settlement with former partner Avobone N.V also relating to the Polish assets. The net effect is a creditor of around $14m. The entire amount is though not due immediately with the payment profile being deferred as indicated in the RNSs, but all are due for settlement by the close of 2017. All in all, unless I have got my calculations horribly wrong or Eroton stumps up some cash then San Leon will need to raise some further finance imminently. I have no reason to believe that a fundraise is indeed imminent apart from my ‘back of fag packet’ calculation above. I did though contact San Leon on 14th February and not to wish the Investor Relation team a happy valentines! I made an inquiry about the cash position and the plan to continue to fund the liabilities as they fall due. I have received no comment so far. San Leon does have a few options at its disposal though. The company in its most recent annual accounts advised it retains a debt facility with YorkVille Advisors. As far as I can tell the terms have not been updated since issue in 2010, If I am correct this agreement provides for a credit line of upto £15m, however this is dilutive facility which means new shares are issued at a 6% discount to the current market price. I would therefore expect San Leon to try and avoid this if at all possible and secure some sort of bridging loan or other short term non-convertible debt funding. Given the projected cashflow from OML18 I believe the company is likely to have some success here in the now more buoyant Oil and Gas debt market. The other option is for the company to try and defer payments to its creditors, the most material of course relate to the Polish settlement. However, clearly this is only viable as a short term measure and attracts interest of 5% per annum during the outstanding period, It is not clear the terms of default though, I suspect more punitive. Another consideration is that some of the corporate costs are provided by related parties, including CEO Oisin Fanning, so there could be some further flexibility here to delay. All in all I don’t think these funding issues are a long term concern, this is a not another Kurdistan but short term San Leon needs to find I would estimate $10m imminently and assuming the deferred payment due to San Leon in respect of the Poland disposal is received on time in October 2017, then a further $10m or so is needed by the end of 2017. This I believe will settle the final Poland payments and any overheads. San Leon could require a further $4.5m if there is any delay to the consideration receivable. In summary then, if Eroton can settle a reasonable portion of the $39m due then the above concerns go away. It is also worth noting that San Leon is not expected to have any material liabilities once the Poland settlement is off the balance sheet. We do though need clarity on the financial position of EROTON and a revised overview from San Leon on when distributions can be upstreamed. The promise of dividends to San Leon shareholders though still feels very far away until we receive this clarification. What about the supposed Takeover of San Leon? I covered the indicative 80p takeover offer in this piece here. Since then we have had no official announcement. The only output in 2017 is a another rumour of a second Chinese bidder. The cynic in me says this is likely placed by San Leon or an advisor, the motive being to try and force the first bidder to show their hand or up their price. The market though clearly still does not believe an 80p deal will come to fruition given the shares are still trading in the low 50s. Tosca Fund, the largest shareholder are pretty much the only material buyer in the market and single handedly propping up the share price at the moment. To do so it has needed them to increase their holding from 54.41% as at time of the acquisition to 56.75% according to the last Rule 8.3 submission. How will the deal end? We don’t know, it could be a way out for San Leon and its shareholders, but it does concern me that the due diligence is taking so long. For now though the priority is the financial position of EROTON and consequently how San Leon can settle its short term liabilities. Perhaps this is the same question our mystery bidder is pondering…. I have downgraded my view from Buy to Neutral. However, I certainly wouldn’t want to go short from here. Long Term I believe this asset is still very attractive and even a part payment from Eroton would likely trigger a re-rate. The potential bonus of bid talks yielding a firm offer also makes this an attractive proposition. However, San Leon is back in my speculative bucket for now. Watch this space though and those who have a higher risk appetite might consider a punt. As always, do your own research! Small details I know, and only small cashflows from the exercise of warrants- January saw £2.1m from the exercise of warrants, and Toscafund could, if required, exercise its 10 million warrants at 25p as a lifeline. The sooner the significant cash flow from field services starts the better for San Leon’s liquidity. A couple of good points that I have overlooked. Should keep them going somewhat longer. Intersting to note Capital Group also now increasing their share.